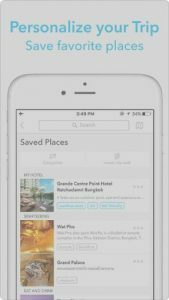 Triposo is your smart travel guide – it’s free and works offline! Our awesome algorithms crunch through millions of websites and reviews to deliver unique recommendations across 50,000 destinations worldwide! Personalize your trip by picking your favorite hotels, sights, activities and restaurants and book them seamlessly in our app! With Triposo, all your bookings are safely stored in one place. That’s not all, our city maps, local tips and personalized suggestions work without the internet so you can wander freely. Trip oso works offline so you can avoid expensive roaming charges and data plans – offline maps, offline routing and offline city walks all at your disposal. We crunch through websites and reviews to provide you with the most comprehensive travel recommendations on hotels, tours, local experiences, bars, restaurants and more. Plan and personalize your trip with suggestions and tips from our experts. Book hotels, tours, activities and transportation all in one place seamlessly through our app. Leave your Lonely Planet or Frommers at home. Your phone and a Trip oso guide is all you need. Triposo works offline and even has an offline map. So no roaming charges. And it’s free! I travel overseas constantly and Triposo is a must for traveling. I’d literally be lost without it!